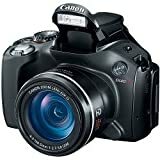 Canon SX40 HS 12.1MP Digital Camera with 35x Wide Angle Optical Image Stabilized Zoom and 2.7-Inch Vari-Angle Wide LCD » DVD's, Blu-Ray, Videos, TV's, Cables, Gear - Everything you need to have to setup to Entertain! The Canon 5251B001 PowerShot SX40 HS 12.1MP Black Compact Digital Camera is a versatile compact point-and-shoot camera that easily captures amazing photos and videos. The HS SYSTEM boosts low-light performance with the DIGIC 5 Image Processor and a high-sensitivity 12.1 Megapixel CMOS sensor. The 35x Optical Zoom offers incredible reach and range, allowing you to shoot any scene, near or far. The camera also features a 2.7-inch Vari-angle LCD for great shooting flexibility. Packed with an array of powerful technologies, the PowerShot SX40 HS is a convenient digital camera capable of brilliant image capture.Built-in Flash Yes: Auto, Auto/Red-eye Reduction, FE Lock, Flash On, Off, Red-eye Reduction, Slow Sync.Effective Flash Range Wide: 1.6 - 23' (0.49 - 7.01 m),Telephoto: 4.6 - 9.8' (1.40 - 2.99 m).What's in the Box: PowerShot SX40 HS Body, Battery Pack NB-10L, Battery Charger CB-2LC, Lens Cap, Case for Hot Shoe Cap, Neck Strap NS-DC11, Interface Cable IFC-400PCU and Digital Camera Solution CD-ROM.